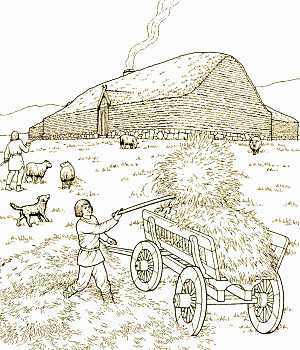 During the Norse era, multiple "families" lived in the same longhouse, working the same farm holding. This "grand family" played an important role in shaping Norse society and its laws and customs, and was the standard unit of society. A household might consist not only several husband-and-wife couples (with one member of each couple typically related by blood to one member of every other couple) and their children, but also the families of servants and bondsmen. During this time, the typical household size was probably ten to twenty people. This household size suggests that at the end of the settlement era, Iceland had a population of about 60,000 people. Settlement patterns in late Viking age Iceland suggest there were about 4,000 farms, of which 1,500 were estates and large farms, while the remainder were smaller settlements. The distribution of resources implies that the 2,500 smaller settlements were dependent upon the larger farms and perhaps even were controlled by the larger farms. Information about Norse families in this era is sparse. Much of it comes from the Icelandic family sagas. And some of it comes from osteoarchaeology, the science of studying the skeletal remains of the people of an era. However, for the Norse era, skeletal studies are flawed. Mortuary practices varied by region. In some places and times, it was customary to cremate bodies, rather than bury them. Of the bodies that were buried, the distribution is skewed by the lack of infants (right) who may not have been buried in normal burial plots and whose fragile bones do not survive well, and by the lack of adult males for whom a significant percentage died violently abroad. Nonetheless, by taking the data that do exist (and applying what appears to be a lot of speculation, as far as I can tell), scholars have drawn conclusions about the demographics of the Norse population. The life expectancy at birth was about 20 years. Half of those who survived birth lived only to their seventh year. Children under the age of 15 made up nearly half of the population. Of those that reached the age of 20, about half reached the age of 50. Perhaps 15 percent of the total population was 50 years or older. And only 1 to 3 percent of population was over 60 years old. The population distribution by age is shown in the plot below on the right (blue bars), clearly showing the skew towards the young. For comparison, the distribution for modern day Iceland is shown on the left (red bars). A typical woman probably bore 7 infants during her lifetime, 29 months apart on average. During pregnancy, women were expected to continue working. After the child's birth, the mother typically returned to work with little delay. Evidence suggests that mothers nursed their children until the age of 2 years, which may have dictated the interval between the births of a couple's children. A typical couple probably had 2 or 3 living children at any one time. Few parents lived to see their children marry. And fewer lived to see their first grandchild. Three generation families were rare. When one member of a couple died, the other remarried quickly. It was probably difficult for a single person to run a household alone. In the medieval era, children were treated as small adults. They were expected to work and to contribute to the productivity of the farm. That is not to say there was no time for play. Children played with toys and dolls. They enjoyed games, sports, and make-believe. Young Óláfr Þórðarson built a play farm house when he was seven or eight years old, according to Bolla þáttur. The author added that children often played in this way. Childhood was also a time for learning. Óláfr's play house was no doubt a child's exercise in building a turf dwelling, one of many essential skills a boy had to acquire. Boys were taught these skills by their fathers, brothers, uncles, and other grown men in the family. Similar, girls were taught by their mothers and other grown women in the family. Víglundar saga says that Þorgrímr Eiríksson taught his sons Víglundr and Trausti the skills they needed, but the mother of Ketilríðr Hólmkelsdóttir refused to teach her daughter any crafts. Ketilríðr's father was mortified by this refusal, and he took his daughter to the family of Víglundr and Trausti to be fostered and taught the life skills she needed. During the Viking age, it was common for a family to give one of their children to another family to foster. It was a bond that could link a man to his social superior. Typically, a child from a superior family was raised by an inferior family. The foster parents received either payment or support from the birth parents. Fostering was not the same as adoption. It was a legal agreement, and an alliance. Ties between foster-relations could be as strong or stronger than those between blood-relations. In addition, fostering was a way to redistribute children among families. Because the infant mortality rate was so high, some couples had no live births. It has been suggested that the percentage of couples without live children was as high as 20% in the Viking age. Fostering was a means to bring a child into a family that had none. Some older boys stayed with men who were especially skillful in certain fields, to learn from them. When he was twelve, Gunnlaugr ormstunga (serpent-tongue) stayed with Þorsteinn Egilsson to learn law, as is told in chapter 4 of Gunnlaugs saga ormstungu. Bold, independent behavior was prized in children, and they were expected to take charge of their own activities. The sagas are filled with examples of children whose bold behavior was praised and admired, although today we might think such behavior to be borderline criminal or psychopathic in nature. The age of majority is not clearly defined, but by the time a boy was 16 years old, he was expected to take on all the roles of an adult male in Viking society. Even younger children took on some adult responsibilities. In order to qualify to be a judge in court, a man need be only 12 years old. Although children were excused from attacks and battles and permitted to leave before a fight began, some young children initiated lethal revenge attacks. Notably, Helgi and Bergr were twelve and ten years old when they killed Þorkell Súrsson to avenge their father's death, as is told in chapter 28 of Gísla saga. Marriage was a business arrangement between the family of the bride and the family of the groom. It was initiated by the male suitor and approved by the woman's father. In many cases, marriages were arranged to build an alliance between families. The marriage was the means by which the families' wealth was distributed amongst the next generation. But that is not to say that the emotions of the man and woman did not play a role. Courting the woman was only natural, but frowned upon by the woman's family as unseemly. Courting might take the form of visits by the man to the woman's house, conversation with the woman, or poems of praise to the woman. While such poems of praise were prohibited by law (Grágás K 238), there are plenty of examples of them, so the law must have been routinely ignored. An example of this kind of courting is described in chapter 5 of Kormáks saga. 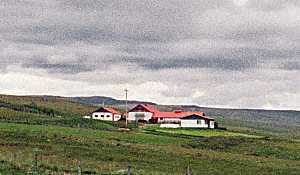 Kormákr regularly visited Steingerðr at Gnúpsdalur, where she was being fostered. While there, he composed poems of praise to her. When her father Þorkell learned of this, he felt that there was the prospect of dishonor to himself and his daughter, and so he brought her home to Tunga (shown to the right as it appears today). Kormákr continued to visit, so Þorkell hired two assassins to kill him. The assassins attacked Kormákr after he left Tunga on one of his regular visits. The assassins were incompetent, and Þorkell could see they were making no progress. He took up his weapons and prepared to head out to assist them. Steingerðr saw what her father was up to, and she took his hands. He made no further efforts to help the assassins, and Kormákr killed them both. Ultimately, Kormákr asked for Steingerð's hand, and the wedding was arranged, which ultimately did not come to pass. A man looking for a bride might seek the advice of family members before taking the first steps towards marriage, for a misstep could be costly. If a marriage proposal did not immediately follow courting, the woman's family was embarrassed and insulted. If a marriage proposal was rejected, the man's family was similarly injured. In either case, blood vengeance might be sought. Marriages had two parts: the betrothal and the wedding. The betrothal was a commercial contract between the woman's guardian (usually her father) and the suitor or his representative (usually his father). The proposal was made to the woman's guardian, usually by a representative of the suitor. Whether the woman's consent was sought or not is not clear. The law suggests (Grágás K 144, St 119) there were only a few instances in which a potential bride could turn down a arranged match, yet the sagas are filled with examples on both sides of the question. On one hand, Höskuldur arranged for the marriage of his daughter Hallgerður with consulting her, which angered her greatly, as told in chapter 10 of Brennu-Njáls saga. Yet on the other hand, when a request for Guðríð's hand was placed before her father Högni, he said that the mother and daughter would have the most to say about the decision, as told in chapter 5 of Harðar saga og Hólmverja. However, coercion was not unknown in order to force an especially attractive political or economic bond between two families. The groom's family promised to pay a sum called mundr (bride price) to obtain the woman. The bride's father declared his right to give his daughter away and promised to pay a heimangerð (dowry) at the wedding. The two parties shook hands in front of witnesses to fix the bargain, and arranged a date, usually within a year. Thus, the betrothal differed little from any other commercial transaction: there was an agreed upon price, a handshake, and witnesses. The wedding was an elaborate festivity, with feasting (and drinking) going on for several days. It usually took place at the house of the bride's parents. The marriage was considered binding when at least six witnesses saw the couple openly go to bed together (Grágás St 58). If the marriage didn't work out, divorce could be easily obtained by either party for a wide variety of reasons. For example if no children resulted from the marriage, the union could simply be dissolved. It was not unusual for a woman to marry several times. In the earlier part of the Norse era, divorce was accomplished simply by either party declaring the divorce in front of witnesses. Since marriage resulted in a co-mingling of two families' wealth, it is not surprising that divorce often resulted in disputes on how the couple's wealth should be divided and returned to the original families. Straightening out the finances resulting from a divorce could result in blood feuds between the families that lasted for generations. After the divorce, the woman was entitled to one-half of the estate. In addition, if the man were at fault, both the bride price and the dowry reverted to the woman. Thus, after a divorce, a woman could retain substantial economic independence and could easily remarry. The threat of divorce, and of the financial ruin that would result, was used by women to influence their husbands. In chapter 9 of Gísla saga, Þorkell learned that his wife Ásgerður had been unfaithful. That night, he forbade his wife from entering their bed. Ásgerður would have none of it and threatened divorce. Þorkell thought quietly and then allowed his wife to join him in bed. Nothing more was said about the matter. On some occasion, a bride who didn't care for the arrangements made by her family took steps to ensure that the wealth didn't leave the family. Signý was unimpressed with the match made by her father, so she handed all of her property over to her brother so that it would stay within the family, as told in chapter 3 of Harðar saga og Hólmverja. Other methods of ending a marriage are also described in the sagas. Hallgerður was not pleased with her arranged marriage to Þorvaldur, as told in chapter 11 of Brennu-Njáls saga. An argument between them led to Þorvald's striking Hallgerður. Later, her foster-father, Þjóstólfur, visited and learned of the shameful blow. He left immediately, and when he returned, Hallgerður asked why his axe was all bloody. He replied, "I've done what will allow you to marry a second time." The sagas talk of loveless marriages. Hrafn tricked Helga into marrying him by saying that her intended husband, Gunnlaugur, was not returning from Norway, as told in chapter 11 of Gunnlaugs saga ormstungu. When Helga learned of the deception, she and Hrafn never again enjoyed intimacy. A male was considered to be an adult after he had passed 15 winters. Women married early: perhaps as early as 12 years old. Virtually all women were married by the age of 20. When a child was born, the child was accepted into the family by means of a set of rituals. The mother accepted the child by nursing it at her breast. The father showed acceptance by taking the infant onto his knee, giving the child a name, and sprinkling water on the child (vatni ausinn). Once the infant was named, sprinkled, and suckled, then the Norse inheritance laws came into play, and the baby had inheritance and other rights within the family. An infant that was not accepted for one reason or another was put to death by "exposure". The unwanted baby was put outside, exposed to the elements, until death ensued. This was usually done only in the case of birth deformity, or because of economic hardship. An archaeological study of one Norse era farming village turned up an abandoned well in which many dozens of infant skeletal remains were found. In addition to marriage and fostering, individuals and families could be bound together in other ways in Viking society. Perhaps the most powerful bind was that of blood-brotherhood. The arrangement is described in Fóstbræðra saga, in which Þorgeir and Þormóður bound themselves together, each swearing that whoever died first would be avenged by the survivor. The ceremony is described in more detail in Gísla saga. A piece of turf was scored out of the earth and raised into an arch using a spear such that both ends of the turf strip remained in the earth. Under the earthen arch, the men drew blood and let it flow into the earth and stirred it together. They swore that each would avenge the other as if they were brothers. Yet, the ritual was broken before it was completed when Þorgrímur withdrew his hand. The rituals for the dead in Norse society varied from between different regions, different times, and different social classes. The Norse pagan religion taught that, with few exceptions, the dead didn't "go" anywhere; they stayed in their graves. Yet at least some of the dead were buried in rich graves furnished with all sorts of objects for daily life. And some of the dead were buried in ships, or in ship replicas, as if they were going on a journey. It's hard to relate the grave finds with the religious ideas found in the old Norse literature. And at least some of the rich grave goods must have been placed simply to impress the neighbors. The poorest people were buried in a simple hole in the ground with a few belongings. Warriors were sometimes cremated, with their swords bent and shields broken, although this practice is more common in the times before the Viking era. Most people were buried with a few of the things they used in everyday life. A prosperous man might be buried along with his horses, slaves, weapons, and a variety of household goods. 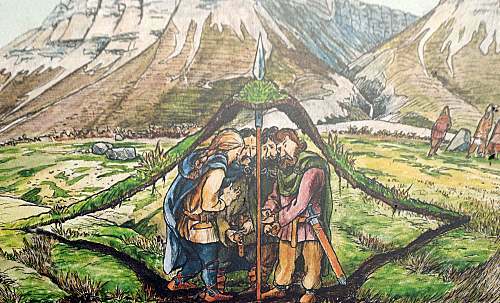 The sketch shows an interpretation of the burial of Skallagrímr Kveldúlfsson, a blacksmith, and a wealthy, powerful chieftain in Iceland. The body was placed on its side in a shallow grave, with his blacksmithing tools and weapons placed nearby, along with his horse. 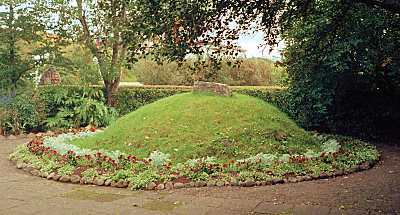 The grave was covered with a mound. The grave mound of Skallagrímr is shown to the right as it appears today in the town of Borgarnes. Skallagrímr was one of the early settlers in Iceland and father of Egill, a prominent chieftain and poet. Egil's son, Böðvarr, is also buried in this mound. Some intriguing evidence suggests that the grave goods are not always those of the body found in the grave. For example, the grave found at Hringsdalur in west Iceland was a rich find, containing a sword, shield, axe, and spear, along with personal items. Yet the skeletal remains of the man in the grave suggest a very slight individual, not physically capable of wielding the weapons. One possible explanation is that the man was a proxy in the grave for the dead warrior who originally owned the weapons. This explanation is also a possibility for the mystery of grave Bj.581, a very high status warrior grave in Birka containing the skeletal remains of a woman. One (of many) possible explanations is that she was a proxy for the warrior whose weapons she was buried with. Generally, people were laid in the ground lying on their right side with their legs bent and drawn up in the fetal position. The well-preserved skeleton shown to the left is that of a woman and was found in Hafurbjarnarstaðir in south Iceland. She was buried in this position, along with a knife, a ringed cloak pin, a comb, a needlecase, shells, and two small stones. However, other positions have been found in pagan Viking-age burials. Some are on their backs. Some are face-down. Some appear to have been buried in a seated position on a chair. And some seem to have been folded in two so that they might fit into a hole dug too small. 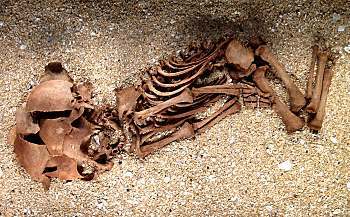 This male skeleton is much less well preserved, but he, too, was buried in a fetal position on his right side. His grave goods included a sword in a scabbard (at the bottom of frame), an axe (near the top), and a shield, which was typically placed over the head. The wood and other organic materials rotted, leaving only the iron shield boss resting on the skull. Wealthy and powerful men were sometimes buried in a ship. A structure was built on the deck in which the body was laid. It was not unknown (but not typical) for his wife to voluntarily join him. Horses, slaves, farm animals, and all the trappings of wealth were placed on board the ship before it was buried. Vatnsdæla saga (ch.31) says that Ingimundur was buried in the boat of his fabulous ship, Stígandi. 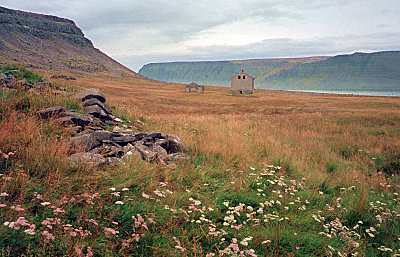 A rich boat grave was found at the farm Vatnsdalur (now abandoned, left) in west Iceland. Within the 6m long (21 ft) boat were the bones of four men, three women, and a dog. Other grave goods included an assortment of jewelry, including a silver Þór's hammer, combs, and an assortment of lead weights (for use with a balance scale). Nearby were found a whetstone and a number of horse and pigs' teeth. At a pagan grave site excavated in summer 2010 at Ingiríðarstaðir in north Iceland, a raised turf structure has been unearthed within the grave field. Cut into the turf wall is a large hole: a chamber which contained a human skull and many animal bones. The evidence is insufficient to interpret the finds, but the bones are suggestive of ritualistic behaviors. 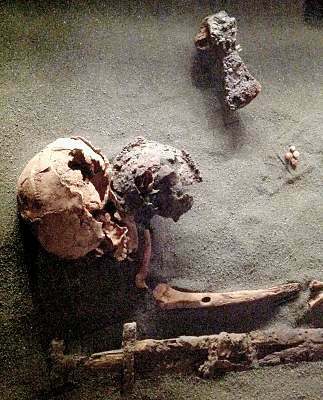 Recent unpublished work suggests some bizarre burial practices in pre-Christian Iceland. Skeletal remains were found in Dalvík in north Iceland with numerous marks on the bones. These have been interpreted as shovel marks made when the skeletal remains were dug up and reburied multiple times in a relatively short period of time, perhaps 2 or 3 generations, as indicated by the dates of the tephra layers. In general, graves were not marked. Only the mounds remain. 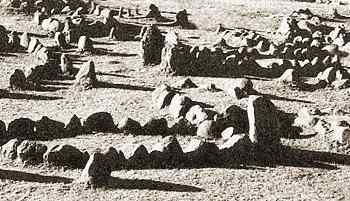 However, some graves were marked with stones, or formations of stones, such as the boat shaped grave markers at the Norse era cemetery in Lindholm Høje in Denmark (left) and the stone outline of a ship (right) from a cemetery on the island of Öland, off the coast of Sweden. Christians were typically buried in an east-west orientation, while heathens were more commonly oriented north-south. Kjartan Óláfsson's mound in the churchyard at Borg (right) is easy to find: it's oriented at right angles to all the other graves. After Kjartan was killed, his uncle, Þorsteinn Egilsson, brought the body to the new church at Borg to be buried, since there was no church at Kjartan's farm at Hjarðarholt. 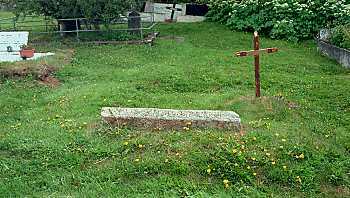 Kjartan's grave, marked with a rune stone, is perpendicular to the Christian grave immediately adjacent. Suicide was not unknown in the Viking age. Chapter 23 of Vatnsdæla saga says that when two of Ingimund's friends heard that he had been killed ignobly by the despicable Hrolleifur, one said, "Life is not worth living for the friends of Ingimundur." They each killed themselves with their saxes. A video presentation on Life after Death in the Viking Age by Dr. William R. Short, manager of Hurstwic, LLC. The lecture discusses Norse beliefs in what becomes of a person who dies, and the talk was part of the Hurstwic Heathen study group series of presentations and discussions.